It's a Mystery Video Slot Review - Casino Answers! It’s a Mystery is a 5-reel, 25-line video slot developed by Realtime Gaming, featuring a wild symbol, scatter wins, multipliers a free spins feature, a guaranteed bonus game, two progressive jackpots and more. You can play the It’s a Mystery Real-Series Video Slot at Bovada. Bets on the It’s a Mystery slot machine are $0.01, $0.02, $0.03, $0.04, $0.05, $0.06, $0.07, $0.08, $0.09, $0.10, $0.25, $0.50, $1, $2.50 and $5 per line. You must play all 25 paylines at all time on the It’s a Mystery slot game. You can bet as little as a quarter per spin on the It’s a Mystery online slot up to the maximum total bet of $125 per spin. It’s a Mystery has a good betting range, suitable for most online slots players. You can manually skill stop spins by hitting the “Stop” button. To play the It’s a Mystery slot machine, select your bet and press the “Spin” button. The highest paying symbol on the It’s a Mystery video slot is the Question Mark symbol. If you land 5 of a Kind on a payline, you will win the 7500 coin top jackpot. The Question Mark symbol is the wild symbol on It’s a Mystery and will substitute for all symbols except for the Scattered Logo symbol. Other high paying symbols include the Gentleman (2500 coins), the Lady (1250 coins) and the Butler (1000 coins). Hit these payouts when you play the new It’s a Mystery video slot at Bovada! The Feature Guarantee meter (in the top right) indicates the number of spins remaining before the feature guarantee is triggered. Any trigger of the Portrait Puzzle bonus game during regular gameplay will reset the meter to 150. If the Portait Puzzle bonus game is not triggered by the time the meter hits 0, you will trigger the Portrait Puzzle bonus game. Between 3 and 5 puzzle shuffles will be awarded with all of the normal bonus game rules. A different Feature Guarantee meter is used for each bet per line. Each Feature Guarantee meter is independent and decreases when bets are made at that bet only. The Win-Win bonus feature plays following the free spins feature if the overall feature win is less than 10X the triggering bet (excluding scatter wins and puzzle completion prizes). You will be awarded a consolation prize of between 3X and 100X your bet. 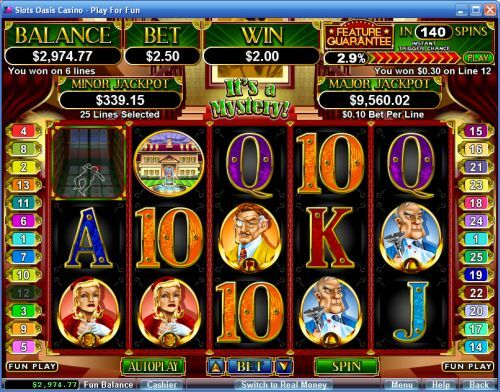 The full paytable is available in the “Help” section of the It’s a Mystery video slot. It’s a Mystery has not one but two progressive jackpots – Minor and Major Jackpot. Minor Jackpot is currently at $410 whereas Major Jackpot is at $9,641 and both are speeding along at a very good pace. You can win either of these jackpots randomly on any spin you make on the It’s a Mystery slot game. Progressive Jackpot wins are added to payline and scatter wins. Random Jackpot contribution is no more than 1.5% of total Return to Player. Wins on different paylines are added. Compulsory 25 line play per game. Scatter wins are added to payline wins. Scatter wins are multiplied by the total bet. Payline wins are multiplied by the bet per line. Highest win only on each payline. Maximum win per paid spin is 50,000 times bet per line. It’s a Mystery has an advanced autoplay mode. Hit the “Autoplay” button to open the autoplay settings. You will be able to set the number of spins, set it to stop when the jackpot is won, stop if a win exceeds or equals (any amount you input), stop on any win, stop if your balance increases/decreases by any amount you input and stop once the feature is triggered. You can stop the It’s a Mystery autoplay mode using the “Stop Auto” button to deactivate it. It’s a Mystery is a very good Real-Series Video Slot from RTG. It has a very good top payout, lots of bonus features, a free spins feature and two progressive jackpots. The bonus game could be more like Clue, but then again there are already a bunch of mystery video slots with similar bonus games. 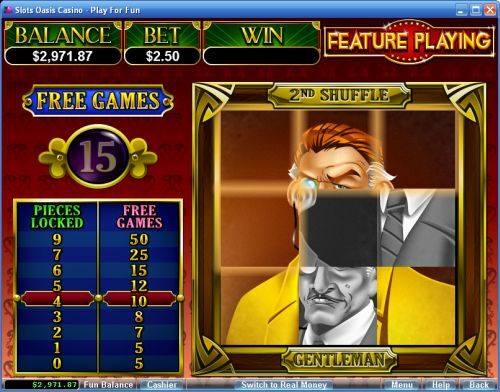 You can try the It’s a Mystery video slot when you sign up and play at USA-friendly RTG online casinos such as Bovada. Where can USA players find the It’s a Mystery video slot? Players from the USA are welcome to play the RTG Real-Series Video Slot It’s a Mystery by signing up and making a real money deposit at Bovada.